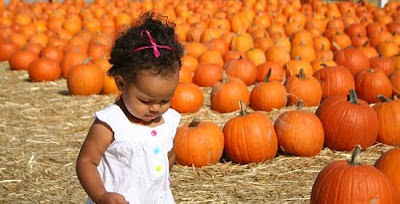 I wanted to take babygirl to a pumpkin patch to run around, take some cute pics and of course get some pumpkins for making all kinds of Fall goodies! I searched around for one near the house and only came up with Pa's. In addition to pumpkins, they have rides and jumpers. They also have a petting zoo and pony rides. Ugh, if it wasn't for that, Pa's would have been pretty perfect for us. The petting zoo was set off from the rest of the area, so we avoided it, but we couldn't avoid the pony ride area. They of course looked worn out and sad as they walked in circles time after time. Babygirl ran toward them saying "dog, dog" as she tends to do for most animals. I just redirected her and we moved on to the carousel, which she couldn't get enough of! 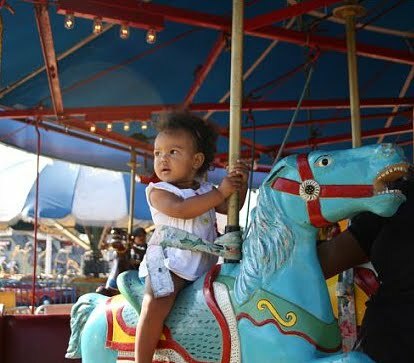 She rode twice and squeeled and laughed the whole time! 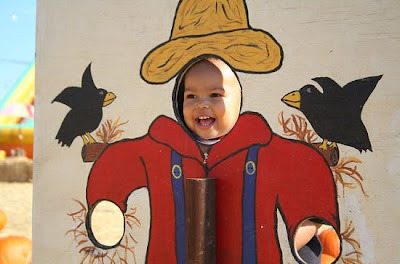 The rest of the time was spent running through the patch picking pumpkins, chasing birds and riding in the wagon. We had a nice time. 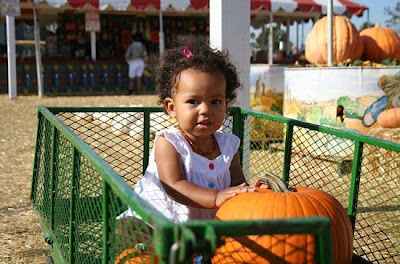 It was a lovely day, the pumpkins were priced fairly and it was magical watching babygirl have so much fun! We topped the day off by watching It's the Great Pumpkin, Charlie Brown when we got home.